Health supplements are often based on patented formulas, created by manufacturers to enhance the effects of the ingredients used. Natrol Collagen Skin and Joint Complex uses such a formula called BioCell Collagen, tested by clinical studies with great success. It is a great thing that the manufacturer provides thorough information on these clinical studies so you can see for yourself how efficient their product can be for treating joint discomfort. Since Natrol Collagen Skin and Joint Complex looks like a dependable product for joint health, we decided to include it here for review. 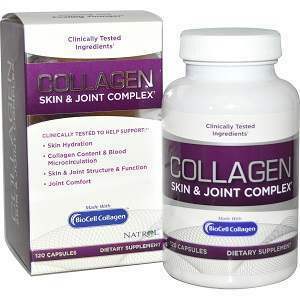 What Does Natrol Collagen Skin And Joint Complex Contain? We notice that the patented formula contains two of the most important ingredients responsible for joint health, chondroitin and hyaluronic acid. Also, the fact that their formula is sustained by clinical studies is commendable, since it means that they put a lot of research into making a product that truly helps people. The recommended dosage is two capsules taken twice daily, with water. Natrol Collagen Skin and Joint Complex comes in 120 capsule bottles, priced at 36.99USD. Since you must take four capsules daily, one bottle counts as one month supply. We saw no clear reference to a guarantee policy on the manufacturer’s website, but they do have contact details readily available, so you can always address any issue you may encounter with your order. Natrol Collagen Skin and Joint Complex is sustained by clinical studies carried on by the company making it, and it is based on a proprietary formula. It contains hyaluronic acid, which is great for both your skin and bones, and it also includes chondroitin sulfate, another key ingredient for joint health. However, we would have liked to see other ingredients included, such as glucosamine and MSM, also clinically tested for their results in treating joint pains and increasing mobility. Mark Stevens	reviewed Natrol Collagen	on December 1st	 and gave it a rating of 2.